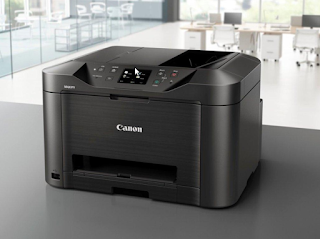 Canon MAXIFY MB2350 Inkjet Business Printers Review - Canon MAXIFY multifunction MB2350 is ideal for small business or professional user home. With LAN or WLAN functionality, the device can also be controlled as a network printer. Canon MAXIFY MB2350 is what is called 4-in-1 device that can be used as a printer, scanner, Fax, and photocopying. Canon Inkjet printer not only receive print jobs from a notebook or PC, but also from a smartphone or tablet. Other highlights, two cassette paper with 250 sheets of paper plus the single sheet feeder, duplex printing and scanning. Canon printer is operated via a color screen 7.5 cm or via a web interface. It is printed via a USB cable, over a network through the RJ-45 connector, wireless via WLAN or just via email. Mobile devices such as Smartphones or tablets also can directly address printer and print through the air-print (apple) and Canon Print Service (Android). Function for scanning is also quite interesting, a good scan software on a PC/notebook or directly on the device. Scan automatically sent to your PC, upload to cloud, sent by email or stored on a USB stick. The template can be scanned as .jpg or PDF. During the copying process, templates can be copied not only 1:1, but also increased 400% or reduce up to 25%. Of course, Canon MAXIFY MB2350 can also create copies of B/w in addition to color. The fourth function of the Fax. Here, the template read straight through scanner and sent via phone after entering the number of the recipient. If the driver is installed on the PC/notebook, they also become a Fax directly from this computer. In front of the printer there are various buttons and screen colors that almost 7.5 cm wide. Touch allows you to configure the printer. This view also displays the settings of the print/fax or scan job. The language menu can be set in many languages. If the printer is connected to a network (LAN or WLAN), it must also be handled via a web interface. This makes it easier to use the printer. Canon MAXIFY MB2350 have power, USB or LAN socket connectors on the back. Sockets for fax and phone lines can also be found here. USB socket (type a) is still found on the front panel. Here you can attach USB-stick to store e.g. scan directly. Printer Canon MAXIFY MB2350 has two paper tapes, each with 250 sheets of type DIN-A4, letter or Din A5. Ideal for offices that require various pieces (white and business stationery). Canon MAXIFY MB2350 using four separate ink cartridges (yellow/magenta/cyan/black). A set of matching will be given at time of purchase. Advantage of one cartridge is that you can replace them individually. Ink cartridges can be replaced only in the Canon printer if they are completely empty. Test prints in format DIN A4 and with the nature of the best printing takes approximately 50 seconds. The quality of color and transitions also reproduced by Canon MAXIFY MB2350. Very opaque black font. The following image is printed in the best print quality, 1200 dpi scan with and counted to 300 dpi. The file now has a size of ~ 26 MB. Without a conversion that has more than 400 MB. Printer Canon MAXIFY MB2350 can also be used by smartphone or tablet and in a variety of ways. Either through direct, via WiFi-WLAN or via email. Also through Apple air print-and Canon Print Service (Android). The application can be found in the respective App store. Canon MAXIFY MB2350 is small, because the multitalent replaces multiple devices. For one, it is a printer, scanner and Photocopying and also Fax devices. Prints with inks, using four individual color cartridges. Maximum print resolution is 600 x 1200 dpi. With a duplex unit, Canon printers can also print double sided. Sheets are changed automatically. Speed Colour : Up to 15ipm Colour Print. Speed Monochrome : Up to 23ipm Mono Print. Printer Resolution : 600 x 1200 dpi Print. Print Method : FINE print head. Warm Up Time : 7 Seconds. Scanner Optical Resolution : 1200 x 1200 dpi Scan. Scan Facility Present : Yes. Scanner Bit Depth : 48-bit/24-bit. Scanner Type : A4 Flatbed ADF. Copy Speed Colour : 10ipm Color Copy. Fax Speed : 33.6Kbps Fax. "Thanks you very much for visiting our Blog. Let me know if the link is dead or Drivers Canon MAXIFY MB2350 not working"